The 88 Project, December 24, 2017: Blogger Ho Van Hai (a.k.a Doctor Ho Hai) was transferred from Phan Dang Luu detention center to Chi Hoa prison in early December. The transfer occurred suddenly, and unable to take his belongings, Dr. Ho Hai has had to sleep on the tiled floor without a mat for the past three weeks. 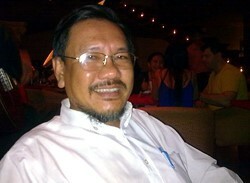 The detention condition at Chi Hoa is harsher and more depriving, so Dr. Ho Hai’s health has deteriorated rapidly. He’s thinner and gaunter than before. In addition, the new prison strictly restricts the provision of supplies by the family, so he does not receive enough food and necessary medication. Although it has been one year since his arrest, little information has been available on the detention of this blogger, including formal charges against him.